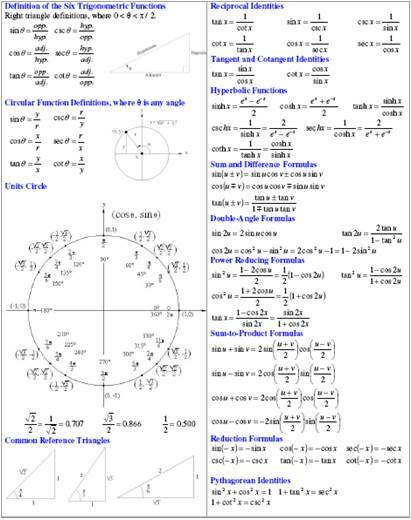 EQUATION SHEETS - Math, Engineering, Equations, Derivatives, Integrals,Conversions. • Never before has such an efficient booklet of equations been published...and yet so small it fits in a folder. • If you hate Math 1050 and have struggled with Math your whole life, THIS IS FOR YOU. • Most Comprehensive Integral Table Ever Published…and easy to read. • If you sell your books and don’t hang on to any equations because you’re feeding a family on a college budget, THIS IS FOR YOU. • If you’re a Phd, you should have this memorized. If you’re an undergraduate, this WILL SAVE YOUR LIFE. • If you’re “going back to school” and “haven’t done math in years”, this is MANNA SENT FROM HEAVEN. • Believe me, no computer or calculator will ever be as quick as a snapshot reference of equations you need NOW. No typing, No searching, No Manual Opening, No walking to the computer lab. It’s already in your hand. • This Equation Sheet contains all the relative formulas, equations, identities, derivatives, and integrals that no one wants to ever memorize. • If you’re an aspiring Engineer and want to keep the conversions straight, THIS IS FOR YOU. • This was developed by an Engineering student who had to work hard at Math to understand it. 2017 © Equationsheets.com. All rights reserved.